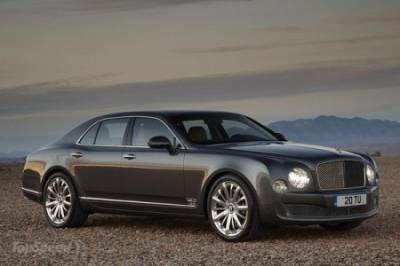 Luxury carmaker Bentley is preparing to submit to the Motor Show in Geneva, and original interpretation of his luxury sports model Mulsanne. Model Bentley Mulsanne Mulliner Driving Specification distinguish the presence of new ductwork, lots of polished stainless steel, black chrome grille, a set of unique 21-inch disks, as well as high-quality leather trim. Under the hood of this luxury will be a standard eight-cylinder V-twin engine with 6.75-liter that produces power in a number of 505 horsepower. A couple of his eight-speed automatic transmission. All this allows to achieve the Mulsanne first "hundred" in 5.3 seconds, and then breaking all the way to a top speed of 295 km / h.